An artist’s rendering of a condominium being built by the Naftali Group on West 77th Street. When was the last time you took a good look at the sidewalk? And not just while glancing away from your smartphone on a crowded Midtown street. Matthew Van Damm finds himself staring at the sidewalk a lot these days. As vice president for marketing and design at the Naftali Group, a four-year-old development firm, he has become something of a concrete connoisseur. His palette is limited, given that there are only three New York City-approved styles of sidewalk finishes. They include the standard mix of overcast-skies cement seen in front of most buildings; a darker version, “landmark gray,” meant to evoke the slate or bluestone slabs of yore; and a special mixture that is basically either of the first two with tiny pieces of obsidian-colored mica added in. Under sunshine or lamplight, the sidewalk can twinkle. “It’s what you’ll find on Fifth Avenue, outside of Cartier or Rockefeller Center,” Mr. Van Damm said. Or outside one of the numerous new condominiums being built by his company. Developers often speak of transforming a block or a neighborhood with their projects, where the buildings serve as a glorified coat of fresh paint. 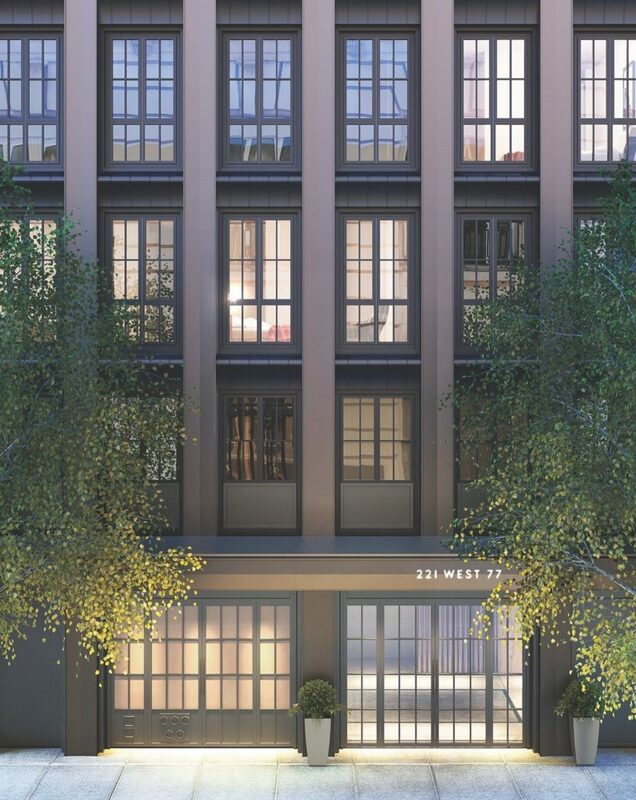 The Naftali Group has taken this approach to a new level on West 77th Street, trying single-handedly to give the short stretch between Broadway and Amsterdam Avenue a face-lift, though it owns only two of the eight properties there. The decision came out of necessity as much as pride or marketing prowess, though there is certainly plenty of both. What attracted the firm to the block in the first place was that, like other short and irregular blocks along Broadway on the Upper West Side, it has commercial enterprises, and most crucially, it sits outside the 12 historic districts in the neighborhood under preservationists’ microscope. These bedraggled Broadway side streets, unlike the townhouse-stuffed blocks to the east and west, are where the residents once stabled their horses — and now their Hondas and Mercedes-Benzes. West 77th Street happened to become a rental car hub, with a Hertz on the south side and an Alamo on the north. Two years ago, Naftali bought the Hertz garage, after a fierce, monthlong bidding war that drove the price of the property up by $10 million, to $55 million. After a year of working out the zoning, design, apartment layouts and finishes, Miki Naftali, the firm’s founder and chief executive, and Mr. Van Damm were standing in front of the run-down garage, looking at the equally run-down one across the street. Wondering how they could give the block a luxurious feel, they realized the easiest way would be to buy the hulk cater-corner from their own. The Alamo garage was as wide and deep as their property, with identical zoning. The price was $8 million more, but the difficult design work, itself a multimillion-dollar undertaking, was already done. The only real difference in the designs for the two 18-story buildings, which have similar zigzagging rooflines, is a balcony here and there and the finishes, inside and out. The building at 210 West 77th Street, the former Hertz garage on the south side, will have hand-laid bricks and mahogany window frames, and more open kitchen layouts. Its sibling — fraternal twin, really — at 221 West 77th Street will be finished in patterned concrete panels and black metal windows, giving it what the developers consider a slightly more downtown look. In all, the two properties will have 51 units, ranging in size from two to five bedrooms and priced from $4 million to about $22 million for the penthouses. Apart from the uniform facades, the buildings gave the company a chance to create a more uniform block. “It meant we could begin to define how the street would look and feel for our buyers, if we controlled both sides of the street,” Mr. Naftali said in an interview. This is the curious problem for the city’s developers. As they scour Manhattan for whatever remaining bits of undeveloped, or underdeveloped land may exist, they find that almost every dowdy block has been claimed and polished, even sandblasted, to luxury perfection. That is where the special cement comes in. The Naftali Group had already employed it at a new condominium building on West 25th Street in Chelsea, another tumbled-up corner of Manhattan. “You might not be focused on what you’re walking on, but it triggers that connection with Greenwich Village or Brooklyn Heights that is so desirable,” said Michael Koontz, a landscape designer who worked on the projects at 25th and 77th Streets. Uptown, given the relatively short block, the Naftali Group has gone further. Not only will it make its own sidewalks shimmer, it has also offered to repave its neighbors’ walkways as well. Negotiations have begun with the owners of a hotel, two new luxury buildings and a prewar rental building. The company also wanted to plant new street trees, and even install new lampposts (all the better to make the sidewalks sparkle). The Transportation Department has resisted that so far. “They don’t want just a single block to have special treatment,” Mr. Naftali said. Yet building a better street can make it worse in the meantime. A neighboring fire company, Ladder 25 and Engine 74, on the north side of the block, has had to keep one of its trucks on the street in a chain-link cage built by the Naftali Group, so that construction on either side of the street would not block the vehicle during emergencies. The Naftali Group wants to cover the cage with a watercolor rendering of what the street will look like once the construction is complete, a paradise in pastels and pavement. Children from the local Jewish Community Center recently painted a mural over the sidewalk construction fence at No. 221, and the artist James Gulliver Hancock has created a wrap for the scaffolding above No. 210, with cartoon versions of King Kong, Rapunzel, Romeo and Juliet, and dozens of other characters. Many residents are more concerned about the immediate changes than those to come.